This application, developed by Mark Botta-Design, allows you to “try on” watches of this brand on your own wrist. Virtual clock accurately display the date and time, and the user can see the principle of unusual time display with UNO 24 hours with one arrow. They display a full review of the daily time. The arrow in the day and night half the dial corresponds to the position of the sun in the sky. The exact hour hand makes for a day full 24-hour rotation. Date changes as soon as it crosses midnight. With this application, you can also take a picture of your wrist watch from any angle and keep it. Note that Botta-Design, offering iOS-application is the first company in the world. 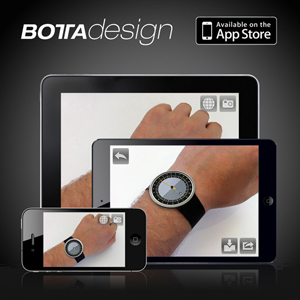 Application from Botta-Design works on all gadgets, iOS, starting with iOS5.